Even though Asif Akbar spent most of his childhood playing cricket and other sports, he developed his all- time passion, singing, in his most private moments and also in school and college. Asif possesses an amazing voice, though he never received any formal training. Iftekhar Hossain Pintu introduced Asif to the music composer, Shawkat Ali Imon, who not only appreciated his tonal quality but also pointed out the minor flaws. Eventually, Asif began his career as a playback singer. Soon, he met Ithun Babu and from then on did not have to look back. 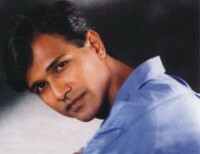 His first solo album, O Priya Tumi Kothay created a ripple in the music industry. He has made 52 albums within the three years of his career, nine of which are solo albums. Asif describes himself to be an honest person. He talks about the struggle to reach his current success and says that while he has not changed as a person, there have been changes only in his financial status. According to him, if he had not become a singer, he would have been a cricketer or a businessman. Asif and his supportive wife recently completed twelve years of their marriage and have two sons.